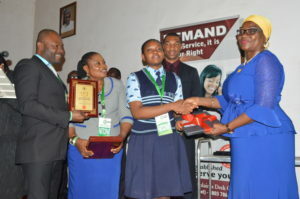 A student of Imperial Secondary School, Eket, Akwa Ibom State, Mbong Utibe-Abasi, has emerged the overall winner of the Anti-Corruption Essay Competition for Students Anti-Corruption Clubs (SACs) in Nigeria. The competition was organized by the Independent Corrupt Practices and Other Related Offences Commission (ICPC) in collaboration with an NGO, Youth Alive Foundation (YAF) and supported by the British Government’s Department for International Development (DFID). The first five winners in the first round of the essay competition which was assessed by the National Examination Council (NECO) and had held in several cities across Nigeria were subjected to a final round of the exercise at the Commission’s headquarters in Abuja. Utibe-Abasi beat the other four finalists to the star prize of a state-of-the-art computer Laptop, while Orogbu Nnedinma of New Fountain Secondary School, Lagos and Abuka Victor Okezie of King’s College, Lagos, were first and second runners-up respectively. Both runners-up also received computer prizes. The Acting Chairman said that the exercise was part of a major function of ICPC in preventing corruption by educating and fostering the support and co-operation of various segments of the society for the fight against corruption. He noted that competitions such as this would inculcate sound moral values and instill zero tolerance for corruption in the psyche of students at their formative stage. Dr. Abubakar also used the opportunity to call on proprietors of schools and other education stakeholders to team up with ICPC for sustained and successful operations of the anti-corruption clubs, saying that such would facilitate the students’ understanding and appreciation of the need to shun corruption. He commended YAF for facilitating the collaborative projects and DFID for providing invaluable support. Also speaking at the event, YAF Head of Operation, Chris Anyim, expressed appreciation to ICPC for the opportunity to execute the project, saying that the Foundation was looking forward to more collaboration with the Commission. Highpoint of the programme was the presentation of prizes and plaques to all the five finalists.